Scientists are racing to to discover the Higgs boson particle first. That's right – CERN isn't the only one looking, and its Large Hadron Collider might be upstaged by a U.S. accelerator yet. Finding Higgs is the major goal of CERN's $7 billion LHC. But after an electrical mistake damaged integral circuits, its restart has been pushed to September. That'll give the United State's Fermilab a fighting chance of detecting the particle with its Tevatron accelerator before the LHC can. Fermilab said it estimates that Tevatron has already picked out eight collision events which could be hints at Higgs, and that its odds of seeing the "God Particle" first are now 50-50 at worst, and 96% at best. Professor Lyn Evans, LHC project leader, scoffed at the idea that CERN had somehow lost the lead. 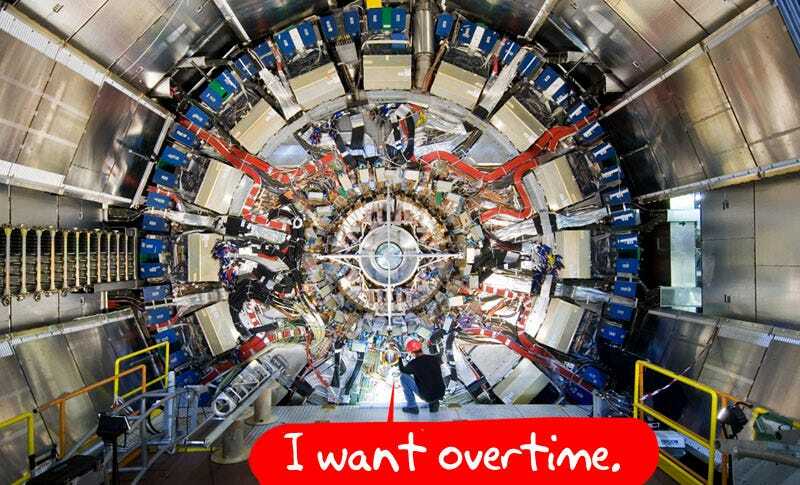 "The setback with the LHC has given them an extra time window. And they certainly will make the most of it," he told the BBC. "If they do find the Higgs, good luck to them. But I think it's unlikely they will find it before the LHC comes online. They may well be in a position to get a hint of the Higgs but I don't think they'll be in a position to discover it..."
"In one year, we will be competitive. After that, we will swamp them," he added. Booyah.